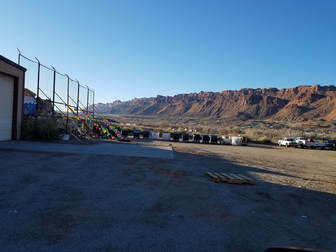 The Community Recycle Center is located at 1000 East Sand Flats Road in Moab Utah. The phone number is (435) 259-3867. The center is open Monday-Tuesday, and Thursday 8:00 am to 5:00 pm and on Saturday from 8 am to 12:30 pm. The center closes for most federal holidays and July 24th for Pioneer Day (see the home page for a list of observed holidays). The recycling center was created in 1991 by a non-profit group known as Canyonlands Community Recycling. This wonderful group brought recycling to life in Moab Utah. Their hard work and dedication to the environment has made recycling a household word in Moab. In July of 2010, Canyonlands Community Recycling transferred the management and operation of the center to the Solid Waste SSD#1 so that they could pursue the goal of furthering education and recycling in the community. 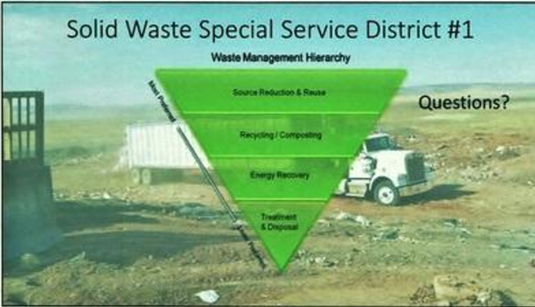 The Solid Waste SSD#1 picked up the reins of this operation in July 2010 and is committed to continuing, promoting and expanding recycling in Moab. At the Community Recycle Center, the District accepts a variety of recycling products and processes them for shipping to United States processing plants. Residents may drop off recyclables for free, commercial entities are charged a fee to offset the recycling costs. Product is stored in a staging area until enough is accumulated for processing into bales. A pricing and shipping contract is then negotiated. A primary goal of the District is to ensure that the Community Recycle Center is supported as much as possible by the sale of products. When the prices are not favorable, products may be stored on site or the District may make the unfavorable decision to not accept products, such as plastics 3-7. A key District goal is to encourage the saving of resources by increasing the materials diverted from the waste stream: By 2017, the recycling rate was over 13 %, however the overall waste diversion rate for the District reached 23% because of the diversion of clean green waste at the Moab Landfill. The diverted material is chipped into mulch. Some of the material has been diverted into windrows with the first composting effort conducted in 2017 as a learning project. The District does have a permit to conduct composting operations at the Moab Landfill and will make another attempt in 2019. At the present time, the District has unscreened compost as well as mulch available for purchase. Due to personnel shortages and the global economy impacts starting first from China, the recycling rate has decreased as many commodities are no longer accepted for recycling as there are no reasonable markets. Efforts are underway to find markets or encourage REFUSE, REUSE and REPURPOSE instead of relying on recycling to reduce material into the local landfills. We are NOT accepting #2 colored or #3-7 or #1 clamshells. Do NOT bring to the center. There are 40 classes of plastics? Number 1 bottles (PET – Polyethylene terephthalate) and Number 2 Natural (milk) jugs (HDPE – High Density Polyethylene) have the highest value per ton for all plastics and the highest Greenhouse Gas (GHG) savings when recycled. #1 PET or PETE – Polyethylene Terephthalate. Found in water and many soda bottles. #2 HDPE – High Density Polyethylene. Found in Detergent Bottles and milk jugs. Milk jugs are considered, “natural” as no coloring or additional materials are added and therefore they are of higher value. #3 PVC – Polyvinyl chloride. Most often found in plumbing but also shower curtains and some outdoor furniture. #4 LDPE – Low Density Polyethylene. Outdoor furniture, food clamshells, shower curtains. #5 PP – Polypropylene. Bottle caps, drinking straws, yoghurt containers, some Ensure containers, some items are compostable, many are not. #6 PS – Polystyrene. Styrofoam containers, disposable cups/silverware, food containers. #7 Other. Anything that is not a number 1 through 6, such as Polyester (clothing), Polycarbonate (glasses/contacts), Polyamides or Nylon (toothbrush bristles, socks), Acrylonitrile butadiene styrene (electronic cases for printers, computers and similar), Polytetrafluoroethylene or Teflon (non stick surface for frying pans), Polyetheretherketone (medical implants), and many more plastics. Diverting one ton of PET water/soda bottles saves 1.02 metric tonnes of Greenhouse Gas (GHG) emissions. Recycling one ton of HDPE-natural saves .34 metric tonnes of Greenhouse Gas (GHG) emissions. Plastic can only be recycled about one time and then it can no longer be recycled. Newspaper (Commercial Accounts only!) – We will no longer accept newspaper at the center from residents due to high contamination rate. NO file folders, NO catalogs, NO newspapers or newsprint or advertisements, NO phone directories, NO magazines. Books (hard or soft bound). – NO catalogs, magazines, telephone directories. The “official” invention of paper was in China around 105 AD. Before that silk, goat skins, papyrus, and stone/clay tablets were used for record keeping. The toilet paper roll was made in 1890. Toilet paper became tissue in 1907. The first paper towel rolls were made in 1931. Paper is made from evergreen conifers but can also be made from bamboo, cotton, jute, hemp, and other plant material. One ton of clean newsprint recycled reduces Greenhouse Gas (GHG) emissions by 2.28 metric tonnes. One ton of office paper recycled reduces Greenhouse Gas (GHG) emissions by 1.95 metric tonnes. One ton of corrugated cardboard recycled reduces Greenhouse Gas (GHG) emissions by 3.12 metric tonnes. One ton of books recycled reduces Greenhouse Gas (GHG) emissions by 2.44 metric tonnes. Paper can only be recycled about 4 times before it is no longer viable for recycling. BUT it might be good for composting in the future! Tin Cans ONLY – NO to wagons, file cabinets, etc. Approximately 100 million tin cans are used every day and recycling one pound can save enough energy to light a 60 watt light bulb for 26 hours or run a TV for 3 hours. One year of recycling steel would save enough energy to heat and light 18 million homes. Tin cans can be recycled over and over again. About 12.3 million tons of steel waste is generated in the United States each year and about 15.4% of the steel in the waste stream is recycled. Every day Americans use ​enough steel and tin cans to construct a steel pipeline running from Los Angeles to New York City and back again! For every ton of steel cans recycled, there is 1.24 metric tons of GHG emissions reduced. This does NOT include large piece of metal such as found in appliances. 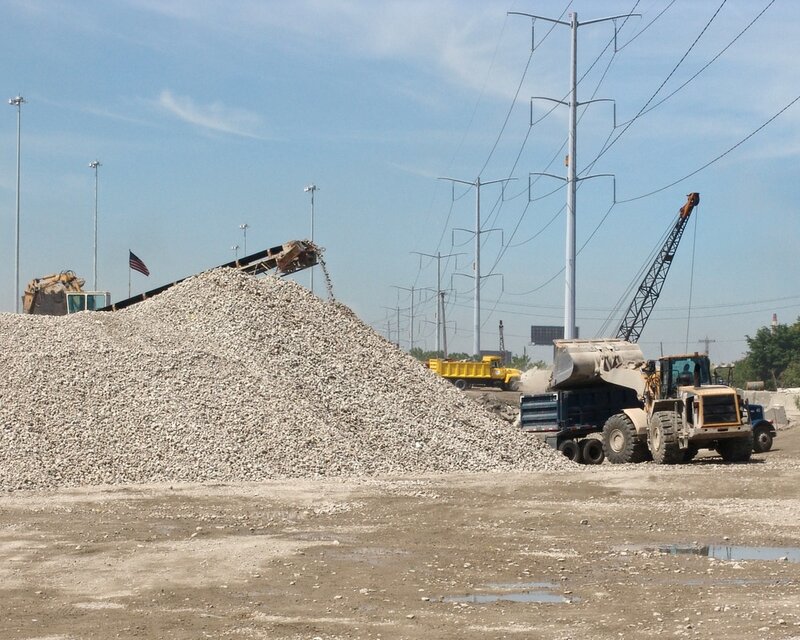 ​Steel can be recycled many times or as one song states, Over and Over and Over and Over again. This is the most recycled product and can be recycled and back on the grocery shelf as a new can in 60 days. Recycling one ton of aluminum reduces mining of 4 tons of bauxite ore, saves about 14,000 kilowatt hours (roughly 40 barrels of oil), and reduces GHG emissions by about 8.60 metric tons. NO to Aluminum foil and pans. They are prepared in a different manner and have other items to make them flexible, so they cannot be recycled with aluminum cans. Health concern addressed in 2017 by OSHA regarding Silicon Dust and resulting respiratory health issues. 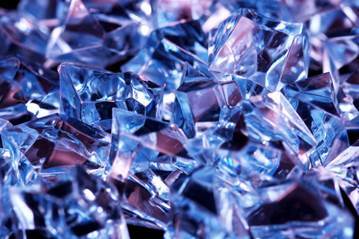 Silicon dust comes when glass is crushed into fine sand like particles. 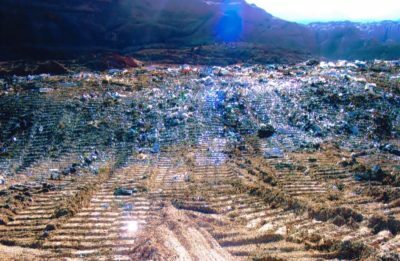 One ton of mixed glass used at the Moab Landfill reduces Greenhouse Gas (GHG) emissions by 0.52 metric tonnes but sending the glass to Salt Lake City, the closest recycling plant, reduces emissions by only 0.28 metric tonnes. 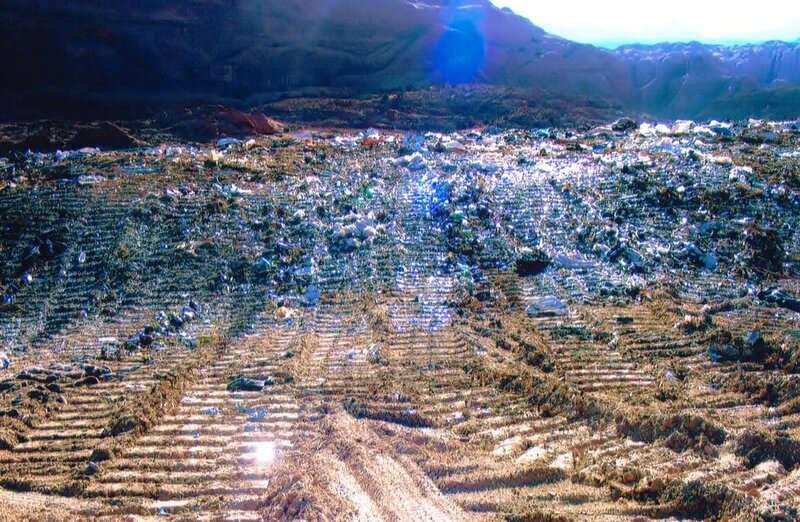 This first picture shows the crushed glass spread over the material at the Moab Landfill. The morning sun makes the ground nice and shiny. The middle picture shows crushed glass that has been tumbled to smooth the sharp edges and can now be used in a landscaping plan. Colored glass added to concrete will tint the concrete or cement.